A good friend asked me for recommendation of no-bake cheesecake recipe and I drew a blank. My immediate association for this retro dessert is cream cheese flavour jello which is less than appetizing. I dug a little deeper and apparently there are other options to set the cream cheese filling without resorting to gelatine. I took a fancy to Nigella Lawson’s minimalist version using cream cheese, icing sugar, and whipped cream with a bit of lemon juice, vanilla, and salt for taste. It is like a blank canvas inviting the cook to play around with flavours, mix-in, and toppings. 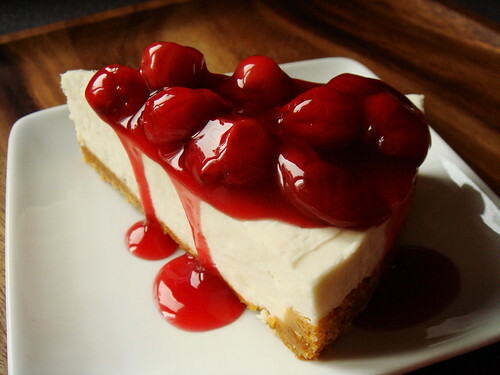 This ought to be the perfect jumping point for my friend to create her own unique cheesecakes. The question remained: how good is this recipe? There were many criteria I considered aside from taste. Texture and appearance obviously play a big role. The cream cheese filling needs to be smooth to contrast with a crunchy graham cracker crust. Each serving of the dessert must look polished and can be quickly plated without too much fuss. 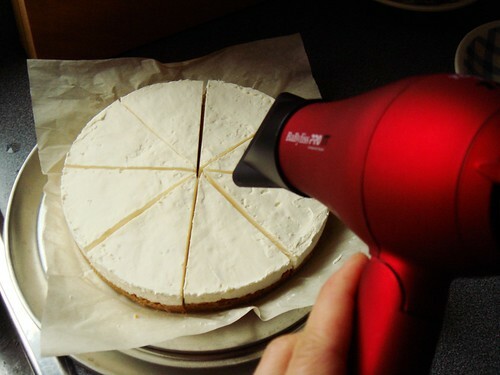 How well does the cheesecake hold in the freezer? Will the final result suffer due to freezing and thawing? It is important that the recipe can be made ahead of time. I am very happy to report that Nigella’s recipe for the cream cheese filling scored high in my book. I followed the recipe as written and then transferred the chilled cake to the freezer. Once it was completely frozen solid, I unmoulded the cake ring by applying a bit of heat using my travel-size hairdryer. It is more precise and fits better in a baking toolbox anyway. I cut the cake into wedges and admired the clean cuts created by my trusty chef knife. I returned the cake to the fridge to thaw completely. It looked so promising at that point but I worried it would slump into a pile of cream in a few hours. Fortunately, that did not happen. Despite of its delicate and airy texture, the cake held up well. I could easily plate a slice without fear of it buckling under its own weight. 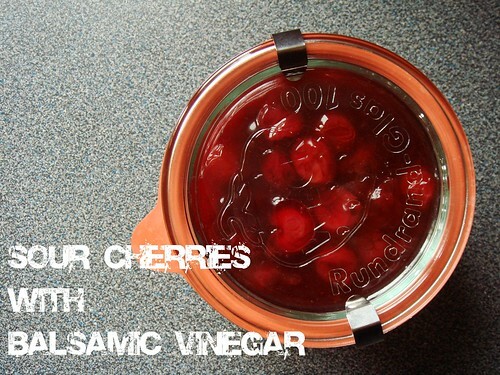 Spoonfuls of glistening sour cherry topping with balsamic vinegar lazily dribbled down the pristine cream-colour filling. My only quip is that the no-bake graham crumb crust lacks crunch. I would spend 10 minutes of baking time and a bit of cooling time to a crunchy bottom crust. Also, a baked crust can get away with using less butter. I liken the texture of this no-bake cheesecake to a SaraLee specimen that you can find in the frozen aisle. It is airy because of the whipped cream and there is a lightness beneath the rich creamy taste. This is definitely not a substantial New York-style cheesecake though I do think there is room for both in the world of cheesecakes. The ease of preparation is definitely a huge plus. My original plan did not include sour cherry topping. You see, I have a precious stash of frozen sour cherries which I washed, pitted, and saved from summer harvest. Last year’s sour cherry crop was a bust in Ontario and I fought hard to procure my little stash. I have every intention to turn them into cherry pie and sour cherry jam to share with Boyfriend. 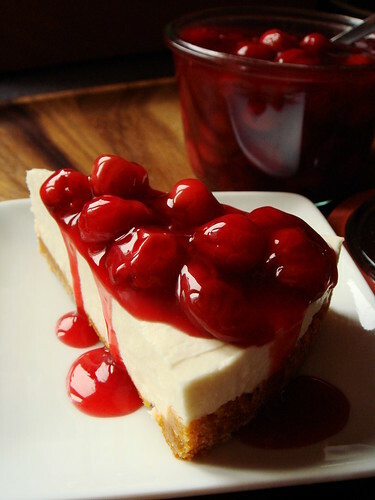 However, the allure of bright red sour cherries on creamy cheesecake was too much to resist. Sure I could use caramel apples or lemony wild blueberries but cherry is classic. As you can see, I gave in. I macerated 300g of frozen sour cherries in 200g of granulated sugar, 1 1/2 tablespoon of cornstarch, and a pinch of salt for about 45 minutes until it turned saucy. I cooked the fruit over medium high heat until the sauce thickened. A little tipple of balsamic vinegar deepened the flavour tremendously. This topping was just thick enough to mound prettily on top of the cheesecake yet loose enough to drizzle. I cannot think of a more fitting partner to this cheesecake.